← Black L.A. 1947: Bert McDonald Dies; First Black Deputy City Atty. March 14, 1907: A Now-Forgotten ‘Carmen’ Passes Through L.A. Accompanied by Times artist Harold R. Coffman, who sketched the singer, Carr conducted a backstage interview with Dereyne with the help of two opera company members who served as translators. As an interview, it is disjointed, poorly organized and frustratingly incomplete; the early work of a green but talented writer who is somewhat smitten with his subject. And yet it is fresh and immediate. “Dereyne dutifully remarked that she didn’t study Carmen” as a character, Carr says. “Sometimes,” she said, with dancing eyes. She made her Metropolitan Opera debut in November 1907 as Musetta in a performance of “La Boheme” with Geraldine Farrar and Enrico Caruso. Her last Met performance was in 1908 as Nedda in “Pagliacci.” After that she seems to have vanished from the stage. And there you have it; a moment backstage in a theater (Philharmonic Auditorium) that is gone with people who are, except for Carr, entirely forgotten. That’s what I love about research. This entry was posted in 1907, 1908, Black Dahlia, Books and Authors, Columnists, LAPD, Streetcars, Theaters and tagged 1907, Harry Carr. Bookmark the permalink. 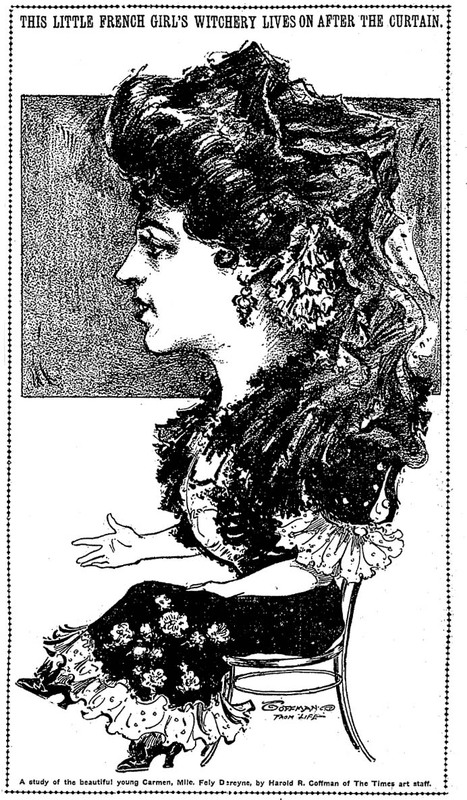 1 Response to March 14, 1907: A Now-Forgotten ‘Carmen’ Passes Through L.A.
She was still performing after 1908. In 1912, she even made a record! I can’t find what became of her after that. I’m assuming she retired and/or married.